Animal Matters was founded in 2010 by Christine Durrant to teach children simple things they can do to make the world a better place. Animal Matters offers products that are fun, eco-friendly, made in the USA and non-violent. Christine began her focus on educating children about the importance of spaying/neutering they're pets, taking good care of them and adoption. Her message has evolved and now includes the "plight of all animals, the oceans, recycling, conservation and how our actions affect animals and the planet." Her belief is that the sooner we can teach children to be kind to animals, the better! 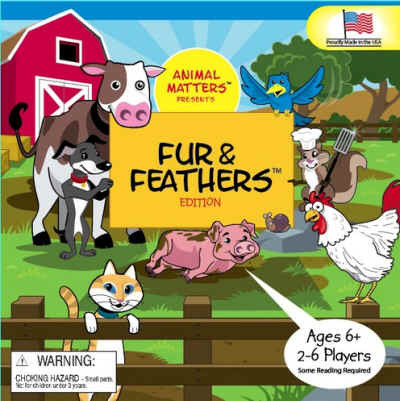 One such product Animal Matter's offers is a board game called Fur & Feathers. It's a fun game for children as young as 4 years old that's filled with facts about animals and how the choices we make every day can affect their lives. The object of the game is to be the first player to save one of each of the five animals. This can be done by correctly answering animal fact questions, visiting their vegan cafe, visiting an animal shelter to adopt a pet or by the luck of the spinner at The Farm. The game includes: 1 large 20x20 colorful game board, 50 animal fact cards, 25 score sheets, 6 playing pawns, 2 attachable spinners, 1 die and 1 instruction sheet. "Fur & Feathers teaches counting, reading, comprehension, strategy, compassion, responsibility and sharing." A portion of the proceeds from the sale of this game goes directly to support rescued domestic and farm animals.